Thousands of UK border staff (Home Office) will strike the day before London Olympics open, the Public and Commercial Services (PCS) union has said. PCS members will strike for 24 hours next Thursday – when many thousands of visitors are due to arrive in the UK. 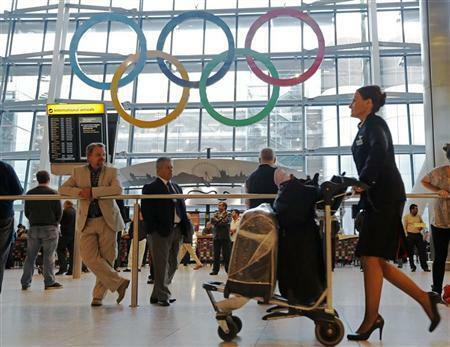 Home Secretary Theresa May said the action was “shameful” as it threatens disruption to people travelling to London for the Games. Immigration minister Damian Green said contingency plans were in place. East Midlands Trains staff has also voted to strike during the Olympics. PCS union members will take other forms of action from July 27 to August 20, including working-to-rule and an overtime ban. The PCS said 57.2% of those who voted backed strike action – the turnout was 20%. The action will involve staff across the Home Office, including the UK Border Agency, the Identity and Passport Service and Criminal Records Bureau. He said he was prepared to meet the culture secretary and home secretary any time in the next week to avert a strike but if they kept their “heads in the sand” the strike would continue. London Mayor Boris Johnson has said he does not think the union will succeed in disrupting the Olympics and the majority of PCS members want to put on a great Games. Damian Green said he was confident disruption at immigration desks could be minimized because extra staff from the Home Office and other departments had been trained to provide cover. Theresa May condemned the action saying: “I think that is shameful, frankly. They are holding a strike on what is one of the key days for people coming in for the Olympic Games. East Midlands Trains drivers from the union Aslef plan to strike on 6-8 August in a row over pensions. But South West Trains staff has voted not to strike over the Olympics. Prime Minister David Cameron insisted the Olympics would be safe and secure. Labour leader Ed Miliband also condemned the strike. The PCS is in dispute with the Home Office on plans to cut 8,500 jobs and the threat of compulsory redundancies in the passport office in Newport, South Wales. There are also disagreements over pay rises capped at 1% following a two-year wage freeze, privatization of services, and alleged victimization of union reps. This week the National Audit Office said the UK Border Agency had laid off 1,000 more staff than intended and was having to hire extra people and increase overtime to meet its workload. The PCS is one of the largest unions in the UK with around 250,000 public sector members. PCS members at the Department for Transport have been taking industrial action over the past few weeks, while staff in other departments, including the ministries of defence and justice, are set to vote shortly on how to campaign against cuts.